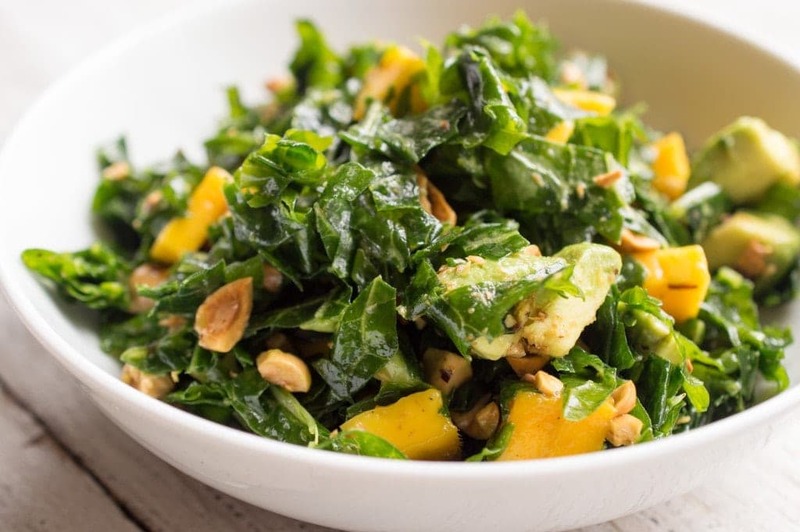 This is my favorite kale salad, hands down, and I’ve been making it for years. 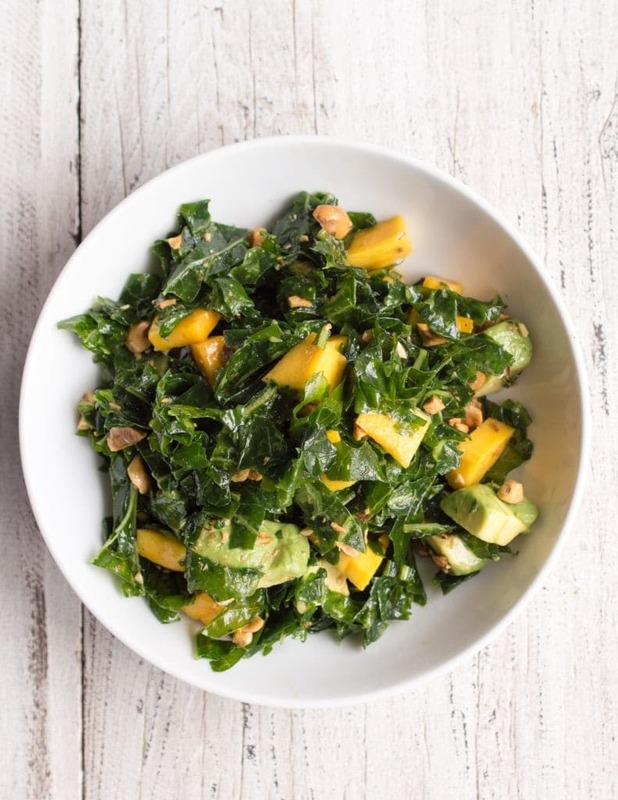 It’s got sweet mango, buttery avocado, and crunchy pieces of roasted hazelnuts, all coated in a sweet and tangy dressing. Also, you get to smoosh it with your hands for a few minutes, which is pretty darn relaxing. The nuts and avocado make this salad very filling, so a cup of it is plenty for one serving. 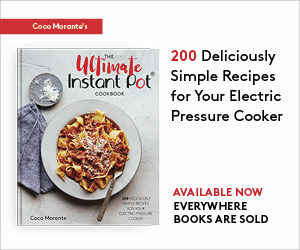 It’ll keep you full for a while even on its own. Of course you can treat it as a side dish, too — it goes great with a piece of grilled fish, chicken breast, or other lean protein. If you’re on a Whole30, substitute a splash of fruit juice for the honey (I used pineapple). If you’re vegan, use agave nectar. I do think the dressing needs a touch of something sweet to tie all of the flavors together. 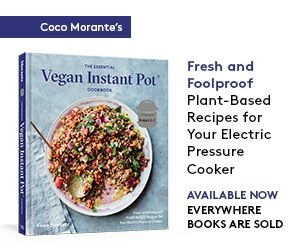 Oh, and of course you can always use another nut in place of the hazelnuts, or even toasted, flaked coconut if you’re allergic to tree nuts. Enjoy! 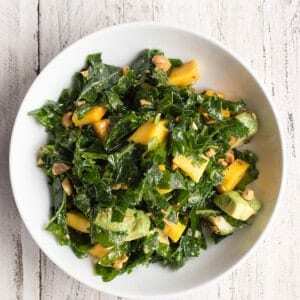 This melange of hearty kale and deluxe mix-ins of mango, avocado, and hazelnuts makes for an unusually rich and delicious way to enjoy your greens. Rest assured, nobody will accuse you of serving them rabbit food. Rinse and dry the kale leaves. Trim out the inner stems and discard. Slice the kale leaves into quarter inch-thick ribbons and place in a large mixing bowl. Add one tablespoon of the olive oil to the bowl with the kale, along with half of the apple cider vinegar and the salt. Using your hands, squeeze and massage the kale for three minutes, until it has wilted considerably. Stir in the remaining olive oil, vinegar, honey, and black pepper. Gently fold in the diced mango, avocado, chopped hazelnuts, and pepper.